Listen! Laugh! Learn! 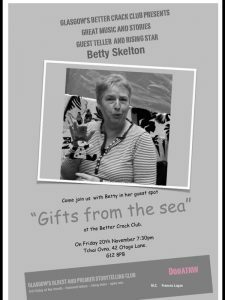 – Betty Skelton, Storyteller – Stories and workshops for all ages and stages. 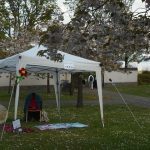 Stories and workshops for all ages and stages. 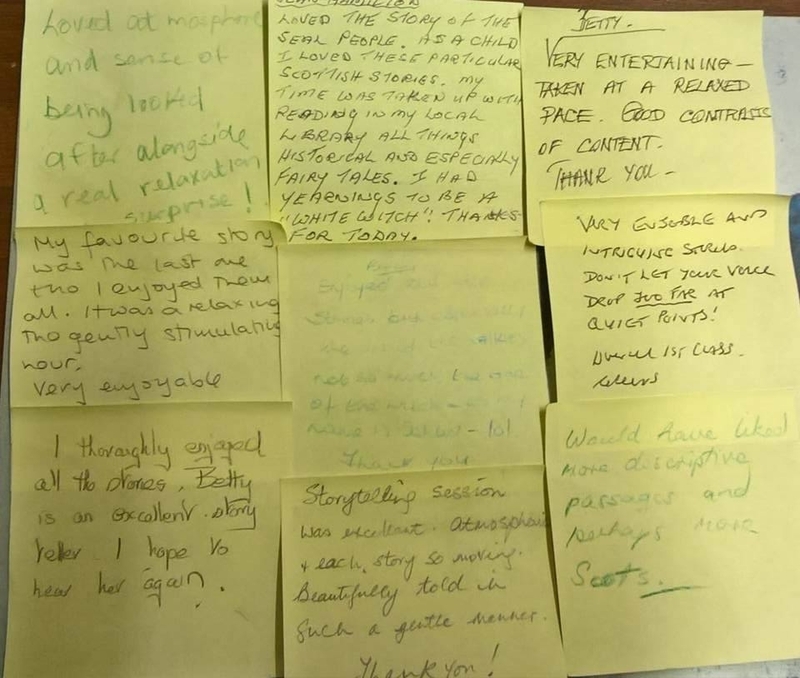 I sat on my Papa’s knee while he recounted his adventures, both real and imagined, and have loved listening to, and telling, stories ever since so it is not surprising that I am now a professional storyteller (who was once a teacher) based in Ayrshire. I enjoy sharing the stories I have collected from many cultures and countries over the years. 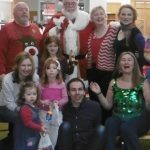 My repertoire contains adaptations of traditional Scottish tales, fairy tales, myths, legends, creation tales and local (Ayrshire/Glasgow/Scottish) stories as well as some true/family/historical stories which are suitable for a wide range of audiences – from pre school children to senior citizens, sometimes even in the same session. As a parent, I discovered the power of stories to allay fears, teach life skills and build confidence and so my tales frequently contain underlying messages to promote compassion, friendship, reconciliation and to help develop life skills, social skills and problem-solving. My quirky humour and caring nature provide a nurturing environment to encourage participation in workshops tailored to suit a wide range of ages and abilities. I am particularly skilled at building confidence and developing language skills in both children and adults. 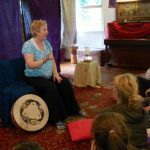 I have told stories and run a wide range of workshops in schools, museums, libraries, church groups and care homes, as well as in castles, fields, woodlands, on trains, and in cafes. Neil Packham, Community Drama Director, Citizens Theatre, Glasgow. 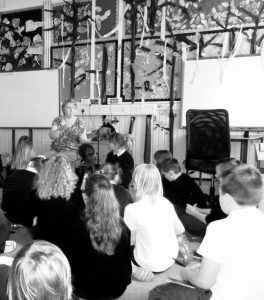 I have many years’ experience of working in schools, enhancing curriculum subjects for students and training teachers in storytelling skills. I have experience of sensory storytelling for people with multiple and profound learning difficulties. I am very keen to take storytelling to new audiences and willing to travel (almost) anywhere. In 2009 I received an SQA level 7 certificate in Contemporary Oral Storytelling. I have a basic disclosure and I am a member of the Scottish Storytelling Directory. If your project is inspiring, extraordinary, strange or unusual yet you have little or no budget it is worth getting in touch with me to see if we can work something out, or if I can signpost you to a more relevant teller or organisation for your needs. £100 – this is my minimum rate. From 5mins to 1hr. £210 – for a longer session. From 1hr to 3hrs. £230 – A morning, afternoon or evening session. From 2hrs 30mins to 3hrs. £350 – A morning and an afternoon session or an afternoon and an evening session. Up to 5hrs. Additionally, travel expenses based on cost of public transport (negotiable depending upon distance) and cups of tea at venue would be appreciated. 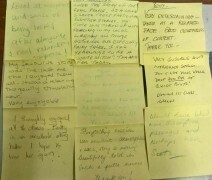 I am in the process of exploring collaboration with a wonderful fluent signer of BSL, Jo Bowie. The power of combining spoken language with visual language is an exciting and important direction to take storytelling. 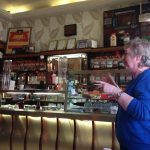 We trialled combining our skills at Glasgow’s Better Crack Club on 21st July. It was well received.